A.C. Electrics carry out all aspects of electrical testing and periodic electrical inspections for public and private sector clients. 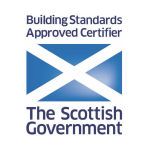 We report on the condition of an existing electrical installation, identifying and prioritising any deficiencies against the national safety standard for electrical installations. Every electrical installation deteriorates with use and age, so it is critical to maintain these installations to ensure that they remain in a safe and serviceable condition. 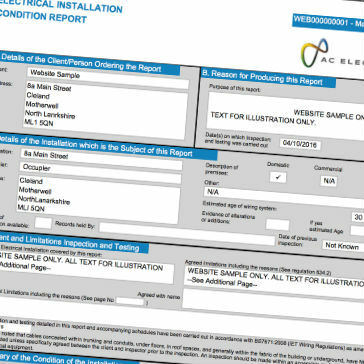 An Electrical Installation Condition Report (EICR) is required every five years for offices and retail premises, and every three for hospitals and industrial properties. These regular tests and risk assessments can be disruptive and time-consuming, which is why A.C. Electrics have invested in the latest technology to ensure that all testing and inspection work is completed quickly and with minimum of interruption to your organisation. Our high-tech testing regime improves accuracy, reduces errors and increases the overall speed of the process. We can test, inspect and record all our on-site results directly to iPad. This allows us to upload from site, to our own secure cloud account, and we can then download and print all certification at our office. This system allows us to provide any certification in a more cost effective manner. Our certificates can also be emailed or presented in disk form. 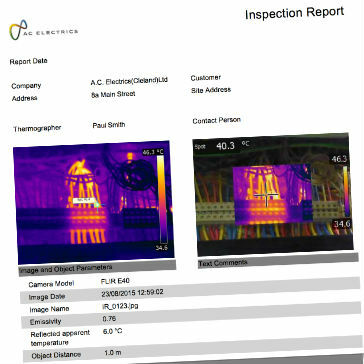 Using the latest Flir thermal imaging technology, our engineers can survey and report on existing electrical installations in order to identify potential problems, for example, electrical overloading, under floor heating faults, & industrial motor performance. All of our thermal image surveys are totally unobtrusive, and does not require switching off equipment, or involve any downtime to your organisation. To find out more about our electrical testing and inspection services, please contact us to learn more about our processes.